DUBAI, 15th January, 2019 (WAM) -- Dubai Chamber of Commerce and Industry today hosted a high-level Kiribati delegation led by the country's President Taneti Maamau, in an effort to enhance bilateral relations and explore new avenues of economic cooperation. 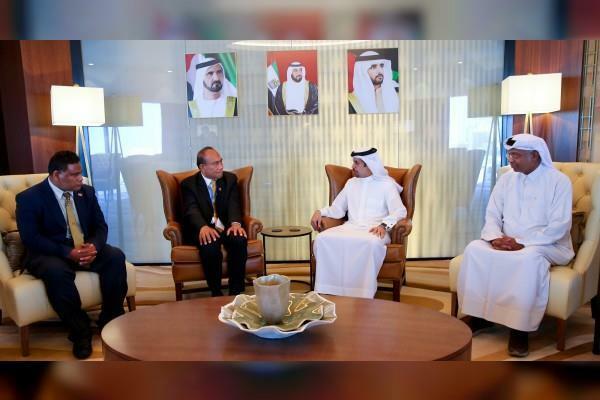 During a meeting at Dubai Chamber's headquarters, Maamau expressed his intention to open up Kiribati's economy and establish new partnerships in several sectors of mutual interest. He explained that Kiribati's economy is fueled by key sectors such as tourism and trade, and noted that the country's fish industry accounts for nearly 80 percent of the Republic's revenue, while Japan, the US and EU are among top export markets. He also invited Dubai Chamber to organise a trade mission to Kiribati to learn more about business opportunities in these sectors and emphasised the importance of open dialogue in enhancing and expanding economic ties. For his part, Hamad Buamim, President and CEO of Dubai Chamber, described Dubai as an ideal re-export hub for Kiribati products and commodities, as the emirate provides easy access to emerging markets. He highlighted various competitive advantages that Dubai offers foreign companies and exporters, including its world-class logistics infrastructure which Kiribati exporters could utilise to expand their global reach. He informed the visiting delegation about the benefits of participating in Expo 2020, and invited Kiribati companies to attend the mega event and take advantage of the opportunities it can offer them. Following the meeting, Dubai Chamber's President gave the delegates a tour around a photo exhibition at Dubai Chamber entitled, 'Zayed and Rashid: Inspiring Visionaries', which celebrates the UAE's 'Year of Tolerance'. The exhibition features historic photos of the UAE's milestones and leaders over the last 50 years.